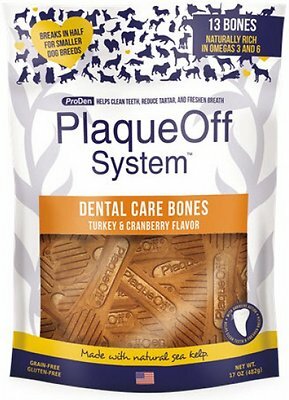 Turn treat time into teeth-cleaning time with the ProDen PlaqueOff System Dog Dental Care Bones Turkey & Cranberry Flavor. These gnaw-tastic dental care chews are made with natural sea kelp and algae to help clean teeth, reduce tartar, and freshen breath. It’s the 100% natural complement to your pal’s dental hygiene that he’ll love as an anytime reward, thanks to its delectable natural turkey flavor. They’re also a great source of omega-3 and 6 fatty acids from flaxseeds for overall wellness and healthy inflammation. Made with wholesome ingredients like potatoes, turkey, kelp, cranberries and alfalfa, you can feel good about giving them to your pup. Plus, they contain no grain, wheat, gluten, soy, corn, artificial flavors, colors, or preservatives. 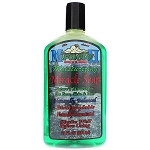 Made with wholesome ingredients like potatoes, turkey, kelp, cranberries and alfalfa. Natural turkey flavor with no grain, wheat, gluten, soy, corn, artificial flavors, colors, or preservatives. Not recommended for puppies under 6 months or dogs weighing less than 5 lbs. Not recommended for dogs with hyperthyroidism. Dried Potatoes, Vegetable Glycerin, Water, Gelatin, Turkey, Dried Kelp, Flaxseed, Alfalfa, Natural Turkey Flavor, Lecithin, Algae Meal, Cranberry, Citric Acid (A preservative), Turmeric.